People Protected LA — the group behind LA’s first people protected bike lane — is continuing to organize, and inviting everyone to sign up for future events. 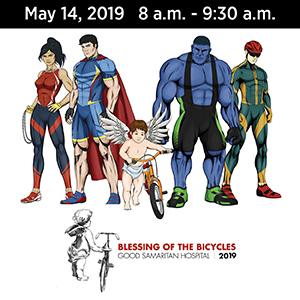 If you’re as angry as I am about the failed state of bicycling and Vision Zero in Los Angeles, it’s definitely worth a few moments of your time to support a group that’s finally bringing bike activism back to the City of Angels. Photo from People Protected LA Twitter account. An Ohio semi driver somehow mistook a bike path for a freeway onramp. I’ve been bitten by a deer fly, and it didn’t look anything like that. A North Carolina driver hit a deer, nearly knocking it into a group of bicyclists headed in the other direction. The war on cars may be a myth, but the war on bikes goes on. A Dublin cab driver chases down a bike rider, cutting into the bike lane and climbing a sidewalk trying to run him down. Which led to this heartbreaking and infuriating statement from a local advocacy group. That is absolutely outrageous. Driver needs to go to jail and should never be able to drive a public service vehicle again. This is where the anti-cyclist media narrative is leading us. Many drivers now consider cyclists subhuman. We’ve been dehumanized. We’re vermin. 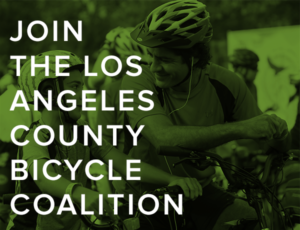 The LACBC will take a haunting pre-Halloween Sunday Funday ride this weekend. How to navigate LA’s ever-increasing transportation options. 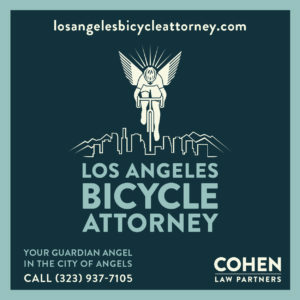 The West Hollywood Bicycle Coalition is hosting a panel discussion on bike law with BikinginLA sponsor Jim Pocrass on October 18th. Santa Monica-based Bird gets serious about advocacy, hiring the executive director of New York’s groundbreaking Transportation Alternatives to be its new director of safety policy and advocacy. If you didn’t get enough open streets at last week’s CicLAvia — or just want a calmer experience — Santa Monica’s annual COAST open streets event will take place this Sunday, closing over two miles of city streets to motor vehicles. And opening them up for everyone else. No surprise here. The CHP reports men are eight times more likely to die in a bicycling collision than women. In part simply because there are more men on bikes, and they’re more likely to ride riskier roads. Plans for a road diet on the Coast Highway through Leucadia are headed to the Coastal Commission for approval, despite opposition from angry homeowners. San Francisco bike advocates take a tour of safety improvements which promise to tame a deadly street. A 20-year old Sonoma County man was sentenced to three-years probation and ordered to stay away from the bike path where he randomly punched a man riding his bike past a homeless camp. Lodi officials decided not to buy an abandoned railroad bridge that could have served as the basis for a rail-to-trail conversion, saying there are better and cheaper options available. Tragic news from Chico, where a man was killed in a collision while riding his bike after allegedly crossing traffic and failing to yield to an oncoming vehicle. High priced titanium water bottle cages for weight weenies. Bicycling explains how to ship your bike in three easy steps. Outside looks at seven quirky, under-the-radar races worth the entry fee, including Folsom’s Rodeocross. A writer from my hometown university says if you want to enjoy the benefits of a bike-friendly campus, you gotta obey the rules. A candidate for Denver mayor blames the city’s traffic problems on bike lanes. Someone should tell him Denver’s traffic sucked when I lived their 30 years ago, before there were any. Streetsblog says the reason Crain’s Business owner and anti-bike crank Ken Crane and others are so angry about Detroit’s new bike lanes is because they’re used to speeding through the city from their suburban commutes. Sort of like the angry Manhattan Beach commuters who forced the removal of the Playa del Rey road diets and bike lanes. 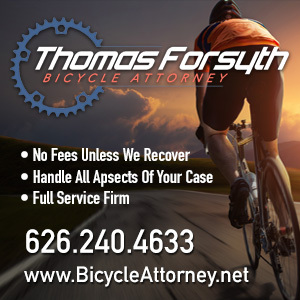 No, a New York court didn’t side with a fallen bicyclist, they convicted the driver. That’s not how criminal cases work. A Philadelphia public radio station examines the bureaucratic nightmare of building a bike network. It just gets worse and worse. An Op-Ed by the editor of a far-right Maryland website starts by calling the decision of the mayor of Annapolis to install a contraflow bike lane “reckless and an abuse of the authority bestowed upon him.” Then devolves into a diatribe against bike lanes and bicyclists in general. A Calgary roundtable discusses why other people are jerks on the road. A ten-year old English girl raised the equivalent of over $500 for a cancer charity by riding her bike 10 miles around town. British bike scribe and historian Carlton Reid has left Bike Biz, the bike industry publication he founded 22 years ago; he’ll now be covering the transportation beat for Forbes. Edinburgh is installing Quonset hut-style bike lockers throughout the city to provide secure bike parking, but charging users more than drivers pay to park in outlying areas. We could use some of those here in Los Angeles. Without the stiff user fees. Now that’s more like it. Paris has installed over 900 security cameras to catch motorists who drive or park in bike lanes and paths. We could use some of those, too. Talk about blaming the victim. After an Israeli ebike rider was killed in a hit-and-run, police try to shift the blame to the friend whose bike he was sharing — even though the driver, a professional soccer player, was five times over the legal alcohol limit when he was arrested a short time later. A New Zealand study suggests the country should be more like the United States than the United Kingdom when it comes to setting speed limits for ebikes, setting speeds at 20 mph rather than the European limit of 15 mph. New Zealand officials urge a hit-and-run bicyclist to turn himself in after crashing into a toddler while riding on the sidewalk, breaking the boy’s leg in two places. Seriously, bike riders who crash into someone have as much responsibility to stop as drivers do. Not to mention a moral obligation not to be a total schmuck. A three-year old Japanese strider bike rider gives a lesson sportsmanship. From disgraced doper to legal dope dealer to team owner. America’s least well known ex-Tour de France winner is forming a new Continental-level cycling team with his share of the money he got from the fed’s settlement with the other one. Apparently, retired pro Alberto Contador is giving Phil Gaimon a little competition for the worst retirement ever, taking the KOM for a legendary Vuelta climb. Pro cyclists Tim Wellens and Thomas De Gendt will turn into bike tourists after Saturday’s Il Lombardia classic, bike packing 600 miles back home to Belgium. VeloNews profiles lone wolf cyclist Justin Williams, who gave up on the traditional cycling model when his latest team folded last year, and now competes in whatever race and format he damn well pleases, while running a development squad for young black and Hispanic riders from South LA. Former world champ Peter Sagan was called an idiot after writing that he had repeatedly bashed a competitor’s wheel during Paris-Roubaix in a failed attempt to straighten his handlebars. Call it gymnastics on two wheels. When you need a good cuppa joe, you can always head to your local bike shop. Or shoe shop, for that matter. And a London bicyclist says drivers are right, we really are that bad.